Car accidents can be a trying experience for anyone, emotionally and physically. Whether a fender bender or a totaled vehicle, ‘when to get a lawyer for a car accident?’ is not only a very important question but an important decision as well. In most instances, it is related to the degree of emotional and physical damage that occurred. In other words, when to get a lawyer after a car accident will be chiefly determined by the severity of the accident itself. 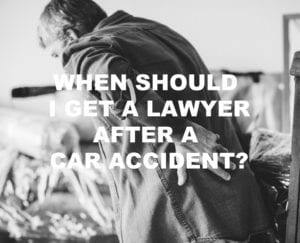 Is It Worth Getting an Attorney for a Car Accident? It is not worth getting an attorney for a car accident if the accident is a minor one without injuries to anyone involved. In such accidents, generally, you would not need the services of an attorney. The parties involved in the accident are better off to file a police report and let their insurance companies sort out the damage. Though these days even a minor fender bender can result in several thousands of dollars in damages to just about any car on the road, as long as no one is hurt in the collision, the first option should be to let the insurance companies handle it. On the other hand, if you believe that the insurance coverage will not fully compensate you for damages to your car, or any minor injuries you may have suffered, then it might be time to consult with a car accident attorney. Minor accidents with multiple parties involved may also require an attorney, especially if determining fault in the accident becomes an issue. Braking to avoid a car at an intersection that’s swerved into your lane to avoid a pedestrian, subsequently causing you to get rear-ended and collide with the swerving car. That just might warrant a call to an attorney. Minor accidents aside, in general, when to get a lawyer after a car accident increases with the degree of personal injury and-or damage to personal property. If the accident involves serious injury or death, it will require the services of an experienced auto accident attorney. When people suffer bodily injury or are killed as a result of a car accident, lawsuits and possibly multiple lawsuits can follow. You may need to face a personal injury lawsuit or file one against the person or persons at fault. If you sustained injuries that have prevented you from going to work or interfered with your ability to lead the life you were living before the accident, it would be worth getting an attorney for your car accident. Experienced car accident lawyers will ensure that you receive maximum compensation for your injuries. Some accidents can impair the earning capacity of individuals for months, years, or the rest of their lives. A car accident lawyer will make sure that you are awarded the compensation you are entitled to under the law. If there are settlement negotiations involved in the aftermath of the car accident, it is worth getting an auto accident attorney. Settlement negotiations can be complicated and trying. Insurance companies want to settle before going to trial because it can save them money, for starters, but reaching a settlement also means that you agree to give up certain rights before you may fully know the extent of your injuries or the effects that it may have on your quality of life as you move forward. Letting an experienced auto accident attorney negotiate for you will in all likelihood increase the settlement for you to get you the compensation that you need. Knowing when to get a lawyer after a car accident is driven by the circumstances of the accident itself. Damages, injuries, severity, costs, at-fault, and the like, should all factor into your decision. Above all, if you feel that you are not being justly compensated or being treated fairly by the other parties involved in the accident, or their insurance companies, you should not hesitate to call an experienced auto accident attorney.